Accelerating student-led innovations to support global public health and well-being. The Bay Area Global Health Innovation Challenge is an annual competition founded by the University of California, Berkeley, Stanford University, and the HealthRoots Foundation for Global Health, which sponsors the $10,000 HealthRoots Grand Prize. This core partnership has now expanded to include the UCSF Institute for Global Health Sciences and UC Davis. 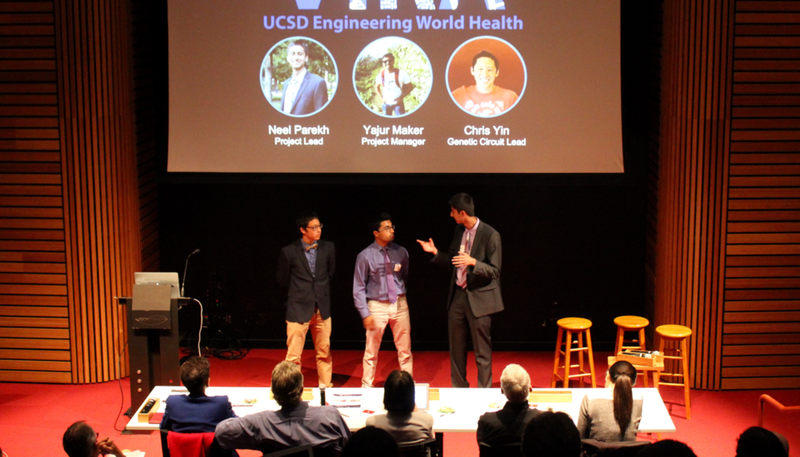 We offer student teams from all schools, disciplines, and degree levels (undergrad through post-doc) the opportunity to present their ideas for low-cost, high-impact, and scalable global health solutions to world leaders in health, tech, design, and impact investing. All finalist teams receive powerful mentorship and development opportunities from expert judges, mentors, and advisors— and one team goes home with the $10,000 HealthRoots Grand Prize. In 2018, we welcomed Challenge judges, team mentors, speakers and workshop leads, expert reviewers, and more from world leaders in health, design, tech, and impact investing, including DRK Foundation, IDEO.org, Kaiser Permanente Design Consultancy, Medtronic Labs, and PATH. If you’re interested in partnering or sponsoring the Challenge this year, please reach out. Each with the Team and Project Registration phase, which will begin in early Spring, 2019. Semi-Finalists will be chosen and asked to submit full applications, which will be reviewed by our expert review panel. Finalist teams selected from this round will be invited to San Francisco in Fall, 2019, for networking and learning activities, culminating in a public pitch event and awards ceremony. The first round of submissions for the Challenge will open soon. In this round, we'll ask you to provide team resumes, a short statement of purpose, and basic information about your project. We're looking for teams with multi-disciplinary backgrounds; high-potential ideas; and innovative approaches to the challenges they address. Join our newsletter to stay in the loop.